Craniosynostosis is a condition in which the sutures close too early, causing problems with normal brain and skull growth. Premature closure of the sutures may also cause the pressure inside of the head to increase and the skull or facial bones to change from a normal, symmetrical appearance. • Autosomal recessive. Autosomal recessive means that two copies of the gene are necessary to express the condition, one inherited from each parent, who are obligate carriers. Carrier parents have a one in four, or 25 percent, chance with each pregnancy, to have a child with craniosynostosis. Males and females are equally affected. • Autosomal dominant. Autosomal dominant means that one gene is necessary to express the condition, and the gene is passed from parent to child with a 50/50 risk for each pregnancy. Males and females are equally affected. • Plagiocephaly. Plagiocephaly involves fusion of either the right or left side of the coronal suture thatruns from ear to ear. This is called coronal synostosis and it causes the normal forehead and the brow to stop growing. Therefore, it produces a flattening of the forehead and the brow on the affected side, with the forehead tending to be excessively prominent on the opposite side. The eye on the affected side may also have a different shape. There may also be flattening of the back area (occipital). Unilateral lambdoidal suture synostosis may cause plagiocephaly, as well. The number of infants with deformational plagiocephaly has risen over the past several years. This increase may be the result of the “Back to Sleep” campaign promoted by the American Academy of Pediatrics (AAP) to help prevent sudden infant death syndrome (SIDS), but other factors can cause this type of plagiocephaly. Specific treatment will be determined by your child’s health care provider based on the severity. Deformational plagiocephaly is treated by altering the child’s usual position of sleep or using a specially molded helmet which will reshape the head over time. The AAP recommends supervised tummy time if an infant is awake to help prevent positional plagiocephaly. • Trigonocephaly. Trigonocephaly is a fusion of the metopic (forehead) suture. This suture runs from the top of the head down the middle of the forehead, toward the nose. Early closure of this suture may result in a prominent ridge running down the forehead. Sometimes, the forehead looks quite pointed, like a triangle, with closely placed eyes (hypotelorism). • Scaphocephaly. Scaphocephaly is an early closure of fusion of the sagittal suture. This is the most common type of synostosis. This suture runs front to back, down the middle of the top of the head. This fusion causes a long, narrow skull. The skull is long from front to back and narrow from ear to ear. The symptoms of craniosynostosis may resemble other conditions or medical problems. Always consult your child’s doctor for a diagnosis. Craniosynostosis may be congenital (present at birth) or may be observed later, during a physical examination. The diagnosis is made after a thorough physical examination and after diagnostic testing. During the examination, your child’s doctor will obtain a complete prenatal and birth history of your child. He or she may ask if there is a family history of craniosynostosis or other head or face abnormalities. Your child’s doctor may also ask about developmental milestones since craniosynostosis can be associated with other developmental delay. Developmental delays may require further medical follow-up for underlying problems. During the examination, a measurement of the circumference of your child’s head is taken and plotted on a graph to identify normal and abnormal ranges. • X-rays of the head. A diagnostic test that uses invisible electromagnetic energy beams to produce images of internal tissues and bones of the head onto film. 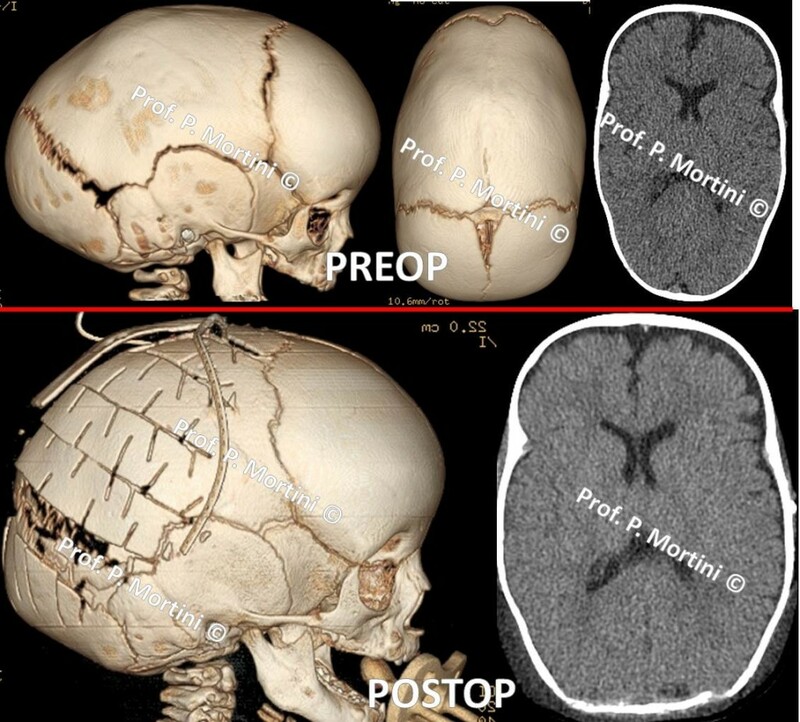 • Computed tomography scan (also called a CT or CAT scan) of the head. A diagnostic imaging procedure that uses a combination of X-rays and computer technology to produce horizontal, or axial, images (often called slices) of the head. A CT scan shows detailed images of any part of the body, including the bones, muscles, fat, and organs. CT scans are more detailed than general X-rays. Before surgery, your child’s doctor will explain the operation and may review “before and after” photographs of children who may have had a similar type of surgery. These complications require prompt evaluation by your child’s surgeon. The health care team educates the family after surgery on how to best care for their child at home, and outlines specific problems that require immediate medical attention.